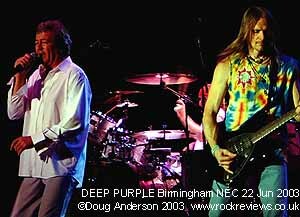 The original text of this page never ended up linked from the Deep Purple index page of the site as it was intended to sit alongside a full review of one of the two shows I saw. 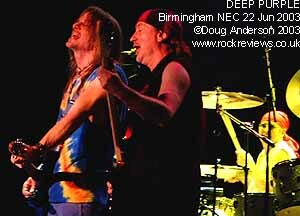 It did however see the light of day on the premier Deep Purple website: The Highway Star where it surprisingly sat among a number of other disillusioned reviews. So almost 18 months later, a few days before the Bananas tour finally returns to the same UK venues listed above, I sat down to see if the text still rang true. It did though I've updated it with some further comments. Well, as far as I'm concerned the band may as well be billed 'Ian Paice's Deep Purple' now as precious little of the band we were attracted to years ago remains. After the cut-down September (as compared to Feb) 2002 set I decided just to buy tickets for the London and Birmingham shows this time. Other than not wanting to drive all the way to and from Glasgow during the week the difference in keyboard sound between Don and Jon was noticeable last September when they alternated tracks and the former seemed to lack something. Not being a musician, or knowing a lot about Hammond Organ technique, I can't fully narrow down what is different but Don seems to lack the depth or breadth of tone during the intros to Lazy and Perfect Strangers in particular. I expect it comes down to draw bar positioning but matching a few bars shouldn't tax a player of Airey's ability. The notes are there but they just don't sound 'fat' enough. In London, other than during a few song intros, I can't say I was drawn to the keyboards at all except when Morse or Gillan stepped up to join Don on his podium. 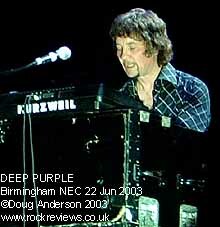 However, now the keyboard player has changed both the original soloists and their respective styles are now no longer part of the larger Deep Purple sound. Ritchie Blackmore left a decade ago and Morse proved a great replacement and rekindled the bands fire. Unfortunately I feel these days he sometimes seems to change the style of tracks rather more than maybe he should (I'm thinking When A Blindman Cries from last year in particular here). Perhaps more importantly the band were smiling and rocking live almost every night - something that wasn't guaranteed between '84 and '93. 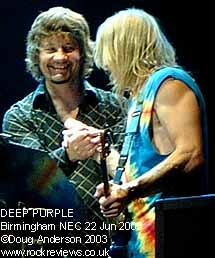 If I had to pick my favourite tour it would have to be 1996 where everybody, band and audience (OK, maybe not the Blackmore fans), were smiling and enjoying the new vibe. Even more importantly something like 2/3 of the new album was played live to amplify the change of staff and style. That hadn't happened since the 1970's. For me it worked though I'm sure many didn't like the change. Roll on to 2003 and another change of staff. Don has been around a long time in many bands and has good connections with the Purple family so with a new album to promote I hoped that something similar to 1996 would happen; another rebirth with fresh new songs taking the place of the staple but increasingly stale back catalogue. 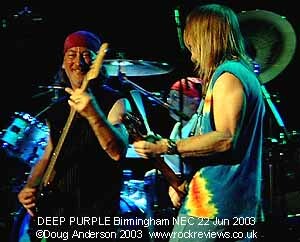 Unfortunately out of a 90 minute set (probably the shortest Deep Purple set I've seen) there were just three new songs; one an instrumental (that was played last year anyway and isn't on the album), another that was played last year though has changed title and lyrics and finally one that is completely new and due to be the single, Haunted. Well, I'm sure there is a lot more to say but I'll keep that for a full review sometime. I just wonder how alone I am in thinking this? Certainly I spotted far fewer familiar faces at the two shows than normal so I wonder if the attraction is fading for more than myself. I await the album with interest but at the moment can't get too excited about any tour supporting it as by the time it swings into the UK (if it does) will most of the new tracks have been dropped as they were in 1998? I think the mate who took my spare ticket summed the Purple set up pretty well, "good but a bit flat!" By comparison he loved Lynyrd Skynyrd and knew equally little of either bands output. I have to say I agree with him even if LS followed a similar pattern to Purple, 3 from the new album and everything else oldies from the 70's heyday. This page is Copyright © Doug Anderson 2000 - 2003. Created: 9 January, 2002. Last updated: 6 November, 2004.